If you have an apple or pear tree that needs a trim, now is a good time to get out and prune it. In this second of a two-part blog, we’ll look at some ways to tidy up your trees. Please note that there’s a difference between training a tree – shaping it so that it has an open center and low, outward branches – and pruning a tree, which is keeping it cleaned up and productive. Today we’re focusing on pruning pointers; for training (shaping) the tree, see the excellent fact sheet from North Carolina State University Cooperative Extension. On a warm, sunny day head out to the yard, gathering up a hand pruner, loppers, and a tree saw. Buckets or a wheelbarrow are helpful for carrying twigs and branches from the area once you’re done. Be sure to take tool disinfestant with you, to clean your tools between every cut. Apples and pears are notorious for carrying Fireblight (Erwinia amylovora), a bacteria that’s lethal to these trees. Cleaning your equipment between each cut is a good plan to reduce the chance that you spread the problem. You can use a mix of 10-percent alcohol to water or use a disinfecting spray. Stand back and look over your tree from a slight distance, checking for branches that are crossing others, broken, or diseased. These are the first you’ll remove. 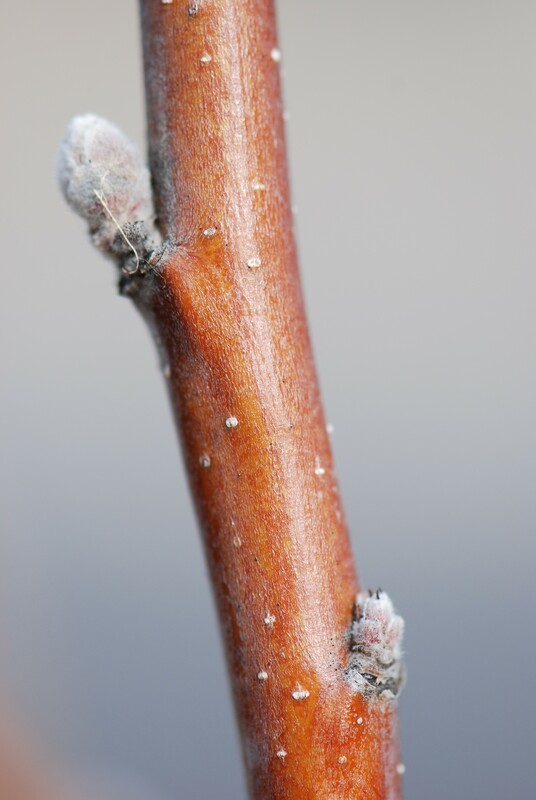 Twig tips that are dried out with a grayish or black appearance should be nipped off, cutting them back to a bud or to the junction of twig to branch. When pruning to a bud (the outward-facing side), clip it one-quarter-inch above the bud at a 45-degree angle, making your angle slant the in same direction as the bud. Prune out any crossing or rubbing limbs, or those that grow in towards the center of the tree. Keeping the center open to sunlight means your fruit will ripen more evenly and be sweeter. Suckers at base of apple tree. Prune these off. Next, target water sprouts and basal suckers (the vigorous upright growth shooting up from branches or from the base of the tree). This type of growth is usually weak, and fruits poorly. Prune it completely off. Finally, remove twigs that grow with narrow angles to the branch. Open angles – where the twig joins the branch – are strong enough to hold the weight of fruit. Narrow angles may break, especially if your tree is loaded with fruit when one of our wet fall snowstorms come through. Apples and pears bear fruit on stubby growth, called spurs, which form on three to five year-old wood. Though most trees put on spurs naturally, some are shy about it and need a little coaxing. Known as spur pruning, this technique is best for young trees that already have good shape. 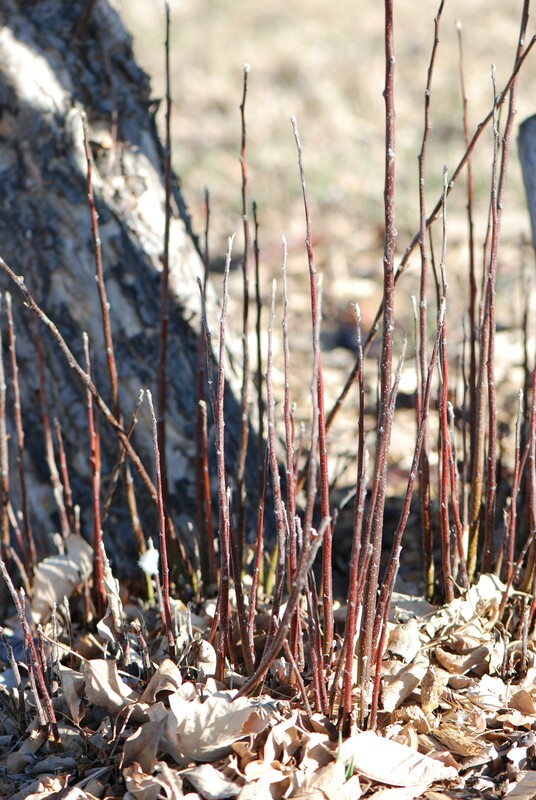 Spur pruning is done on maiden shoots only – those that are one-year-old and unflowered. Clip off the tips of these maidens, leaving just four buds. In summer, this twig will grow both flowers and woody shoots. Apple flower bud (left) and wood bud. Flower buds are much larger, rounder, and fuzzy. Next winter, nip back the branch to the outermost flower bud, or if there is room to let the limb get many spurs along its length, leave three or four wood buds. Apple and pear flower buds are much larger, rounder, and plumper than the buds that grow twigs. When pruning go lightly, removing no more than one-quarter of the tree’s branches in a season. Trees store energy in roots and trunk for the following season; prune off too much while the plant is dormant and the energy is pushed into sucker growth, rather than to healthy, strong wood. Clean up your tree over several seasons if you have to, to avoid over stimulating the tree into sucker growth. When is it too late to prune fruit trees? 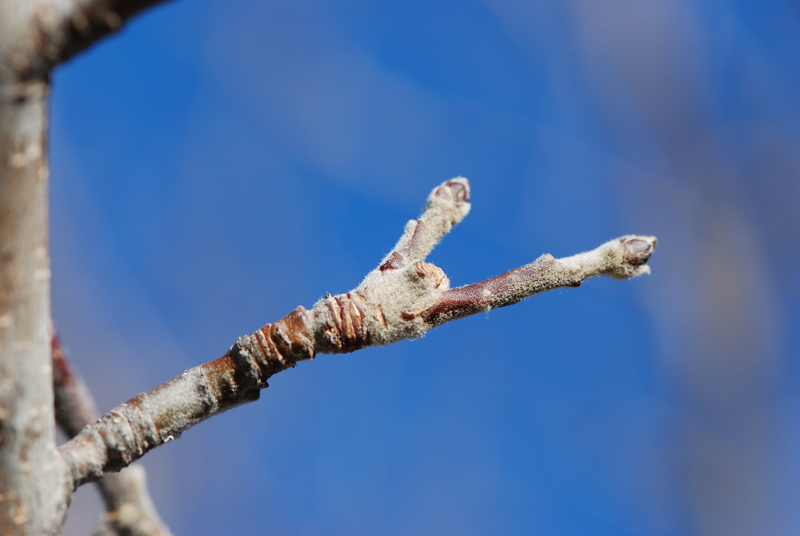 The best time to prune your fruit trees is before budbreak in late winter. But that doesn’t mean you can’t do some trimming now as buds swell, but before they break. If your trees are out of dormancy, pruning can be done. When is it too late? June into July, and late summer into fall. I have an old mac tree that is trying to die everyone tries to get me to cut it down but it usually always has apples, and I protect it. only the other day the bigest trunk fell over. The apples are not quite ripe but the branches are loaded. will they still ripen or should I just clean up my yard now? Does anyone know of a tool to clean the apples up off the ground once they have fallen? I have hundreds of them and it’s killing my back to keep bending over and pick them up. THanks! Hi Linda, I’ve talked to some of my co-workers about your apples, and the general feeling is that yes, those apples should ripen a bit further even though the trunk fell. Reserves in the trunk will be pulled by the fruit, and sugars will continue to develop. They won’t get larger and they might not get as sweet, but hold onto them to give them time to ripen.